For more details click on the headings below or e-mail info@iformulate.biz with any questions. Can’t see what you are looking for? 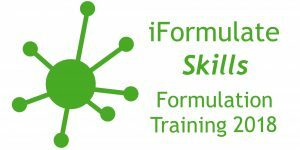 Take a look at our page on past training and events and let us know (e-mail info@iformulate.biz) if any of these topics could be of interest to you. Meanwhile watch this space for further announcements on Formulation Training. We’re delighted to be assisting the University of Leeds with their new three day course on Fluid Bed Processing. This is the second 2-day workshop organised by the SCI’s Formulation Forum and follows the highly successful inaugural event in January 2018. This event is looking to bring together all the elements of formulating for the future into one forum, to learn and discuss how formulations and formulating will be adapted and improved in the advent of new disruptive ideas, techniques and technologies.